One of the most important places for my seemingly elderly girlfriend to visit while we were in Boston was the Cheers Bar, which is exactly what it sounds like; the bar that the TV show Cheers was based on. Never mind the fact that she wasn’t yet born when the show began, it has remained one of her favorite shows. 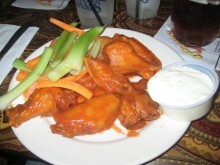 I went for one of my favorite dishes, and one that wasn’t named after any character: buffalo wings. It came with carrots and celery, which I allowed, knowing that my eating companions would enjoy them. My wings arrived fairly quickly and were pretty standard as far as wings went. At a price of just under 10 bucks, I knew I was paying for the location more than for the actual food. The Cheers Bar is definitely worth visiting for a fan of the show, but identically generic food for cheaper prices can be found elsewhere.